Play it Forward project wins the prize! Class 26’s Project Pay It Forward Day presentations were inspiring. Five teams made huge impacts by developing projects that addressed needs in our community. Held at the Civic Center Library and sponsored by the Scottsdale Charros, a panel of judges selected Play it Forward as the winning project. Play it Forward is a new program developed to benefit Ear Candy Charity. Team members are Jeff Miller, Linda Walton, Tyler Butler, Jerry Scheirer, Terri Blau, Joe Holmes, and Todd Miller; Team advisor Denise Pruitt. The goal of the project is to get instruments out of people’s closets and into the hands of aspiring young musicians. The project consisted of two components, a pilot musical instrument drive and developing a manual, ‘You Can’t Mess This Up’ Guide to Musical Instrument Drives, that provides marketing materials, guidelines and the support needed for any group to run a successful drive. The pilot drive was held in conjunction with Arcadia High School’s Contemporary Music and Sound program (CMAS). With the project team’s assistance, CMAS students collected 34 instruments and raised $1000 to fund instrument clean-up and repairs prior to placing them in schools. The manual provides any group, corporations, civic groups, high schools, etc., with the tools to run their own successful musical instrument drives, to benefit their local elementary and middle schools. The team collaborated with Ear Candy to enhance their online donation system, to give future groups the ability to create and host their own Play it Forward page through the Ear Candy website. This enables any group to direct potential donors to their specific drive and track their results in real time. Teachers can request specific instruments so they are placed in classrooms where they are needed most. Each instrument placed in a school provides immediate access for low-income children, impacting up to 10 children per year. Instruments remain in the classroom, benefiting the following year’s students as well, compounding the impact. Ear Candy is a local organization and intends to use Play it Forward to expand their reach and benefit music students across the country. 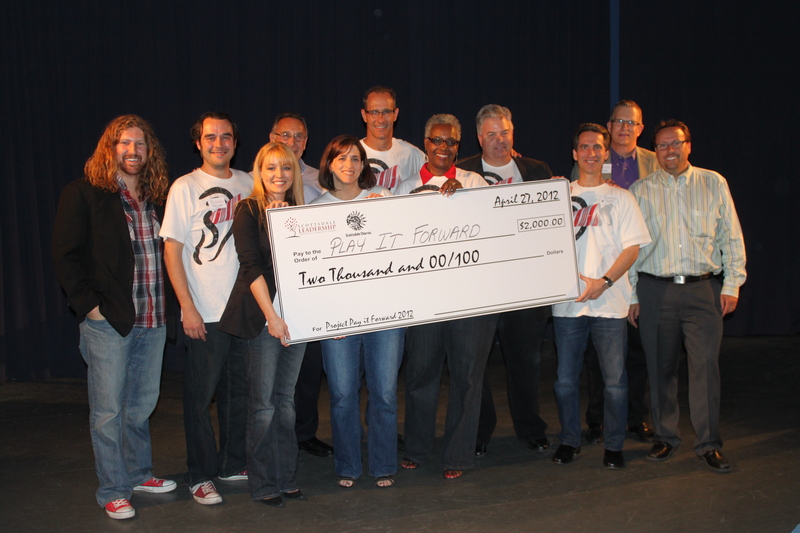 In honor of the project win, Ear Candy receives a $2000 donation from Scottsdale Leadership.